You'd need to have a heart of stone to not be excited about following in the footsteps of Ian Paice, Cozy Powell and Tommy Aldridge, and it seems that new Whitesnake drummer Brian Tichy is very excited indeed. If the statement issued by the former Billy Idol, Ozzy Osbourne and Foreigner sticksman in reaction to the news is anything to go by, he must have been walking around with a huge grin on his face since thestory broke over the weekend. 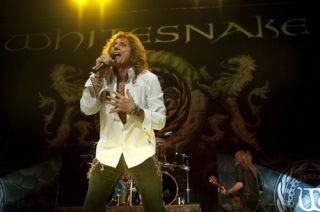 He said: "I am greatly appreciative of the trust bestowed on me by the mighty, Lord Of Voices, David Coverdale, and my bud, who happens to be one of the most killer guitarists around, Doug Aldrich. I am also looking forward to getting it tight with Reb [Beach, guitar] and Timothy [Drury, keyboards]!" He even found time to get in a cheeky pun, saying: "I too, am, and have been, a fan. (I practiced many hours in high school to the 'Slide It In' cassette! I ain't no stranger!)" Mr Coverdale must be very proud.